Black Marlin and their cousins the Blue Marlin are the largest game fish in the world, with large specimens sometimes exceeding 1,000 pounds. 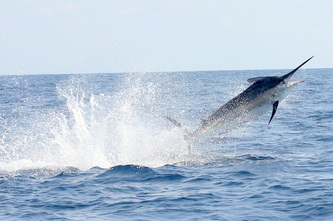 There is no sight more awe-inspiring in fishing than the sight of these massive fish leaping into the air right behind your boat when they are hooked. Because they are large apex predators you often have to hunt for a long time to find one, but when you hook one you forget how long you had to wait. 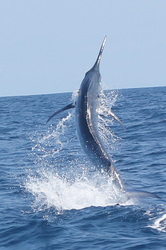 Black Marlin can be distinguished from Blue Marlin not by their color, but by whether they fold in their pectoral fins. Blue Marlin usually fold in their pectoral fins when jumping, while Black Marlin do not once their are adults. Black Marlin have slightly different body shapes, with more weight around the head and shoulder area while Blue Marlin are more uniform. Black Marlin are found primarily in tropical portions of the Indian and Pacific oceans, but can stray to other seas as well. Personally I have fished for them successfully in Mexico, Costa Rica, and Panama. I have fished for them unsuccessfully It’s very hard to fish for these on a budget but I did manage to land a 400lber while fishing from a small panga in Costa Rica. 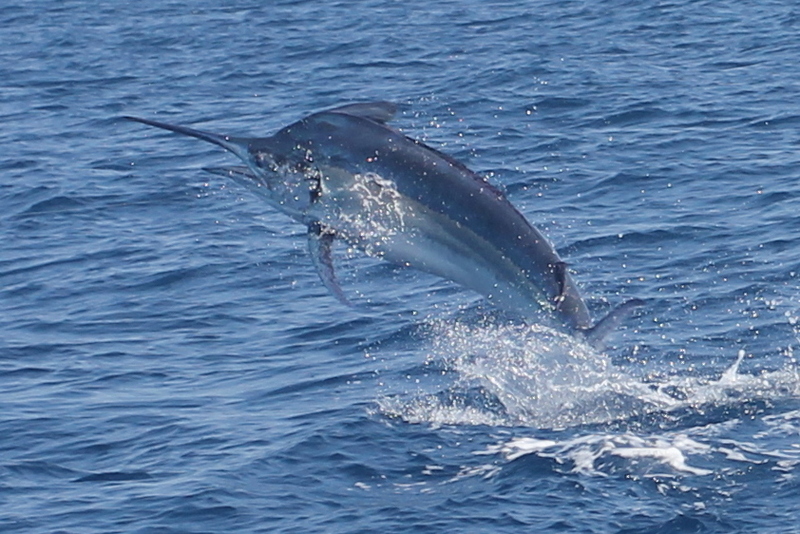 Blue Marlin roam the oceans looking for fish and cephalopods to feed on. They rarely congregate in any numbers, so there is often a lot of time spent looking for them. Fish over 300lbs are nearly always female. I haven’t caught a lot of these, but I hooked some and landed a few and am happy to share what I know below. The key to capturing these giants is having a good captain who knows what he is doing, and I have provided some links to additional resources below if you want to start the hunt. Most fishermen will likely find it easiest to just charter a boat that has the appropriate tackle for these monsters. I personally like to bring my own when I can, and when I do I bring a heavy trolling outfit (I like to use an Accurate Platinum ATD 50 trolling reel and a custom roller rod) loaded with at least 130lb braid and a 300lb mono leader. You don’t want to go through all of the expense of going to a distant location and hooking the fish of a lifetime and then losing it because you pinched pennies on the tackle. 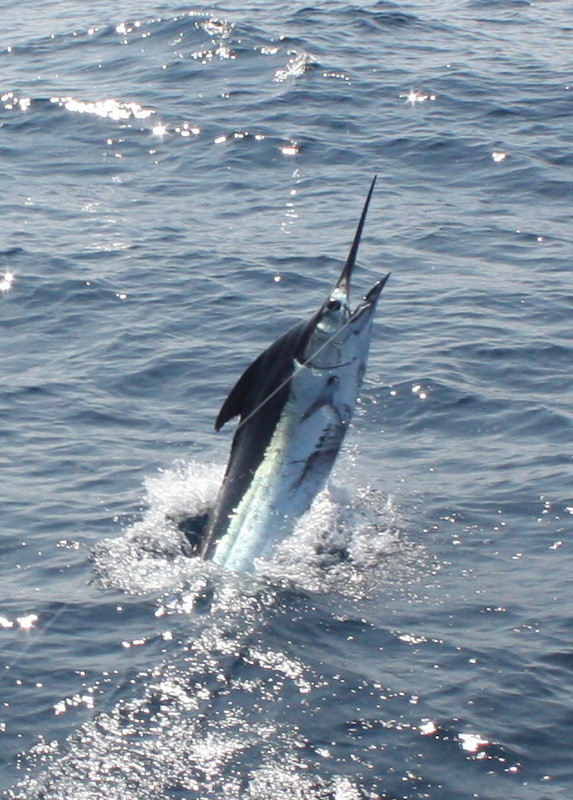 There are two main ways that people catch Black Marlin – slow trolling large live or dead skipping baits like skipjack tuna or faster trolling with large skirted marlin lures. I have no source to back this up but I would imagine that at least 80% of all black marlin are landed using one of those two techniques. 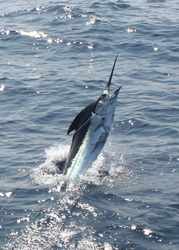 Most marlin hunters use rubber skirted lures such as Moldcraft soft heads, Black Barts, and Pakulas. These are dragged behind the boat at varying distances until a marlin is sighted coming up to look at the lures. At that point you can either hope that it bites or drop back a large live or dead bait to see if you can entice it with that. 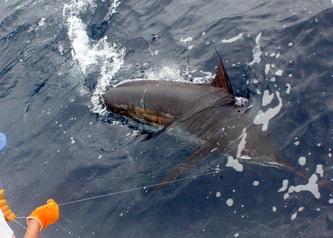 Most fish in the 1-10lb size range that are found offshore where the marlin are will make good live baits. Probably the most common are smaller members of the tuna family such as Skipjack Tuna. These are caught by trolling small rubber skirts or other lures and then quickly placed alive in “tuna tubes” (Note: if you are thinking of chartering a boat to fish for black marlin it is generally advisable to get a boat with tuna tubes so that this kind of live bait fishing is an option). Once you have enough baits you can bridle them and slow troll them until something smashes them. A good approach is to troll one bait on each side of the boat and then have another one down deep on a downrigger if you have one. Most captains now use circle hooks to get a better hookset and ensure a cleaner release. When a fish takes the bait you can ease the tension on the reel until the line starts going out at a good clip that and you can’t stop the spool with your thumb. That usually means the marlin has taken the bait. At that point the captain can gun the engine and (if you are using a circle hook) you can steadily increase the drag tension in order to set the hook. 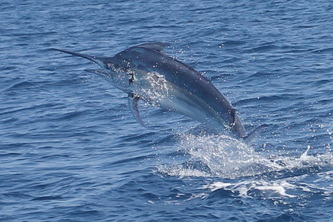 Sometimes marlin play around with the baits by whacking them with their bills, other times they swallow them immediately and head for Guam (note: in Guam they head the other way). You have to pay attention and feel what is going on with the bait through the line. 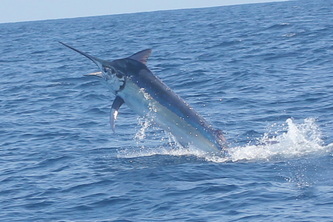 Marlin have tough mouths and it can be difficult to drive a hook in, which is another reason to use circle hooks. The best advice I can give here is to do your research and find a good captain who knows what they are doing and has caught a lot of Black Marlin. Figure out the prime season for the area you are going to, pick an experienced captain, and hopefully you will get some shots. Marlin fishing is never a guarantee no matter where you go, so you have to stack the odds in your favor. Australia is the best known place to land the giants. Fish over 1,000lbs are routinely landed during the peak season off the Great Barrier Reef near Cairns. 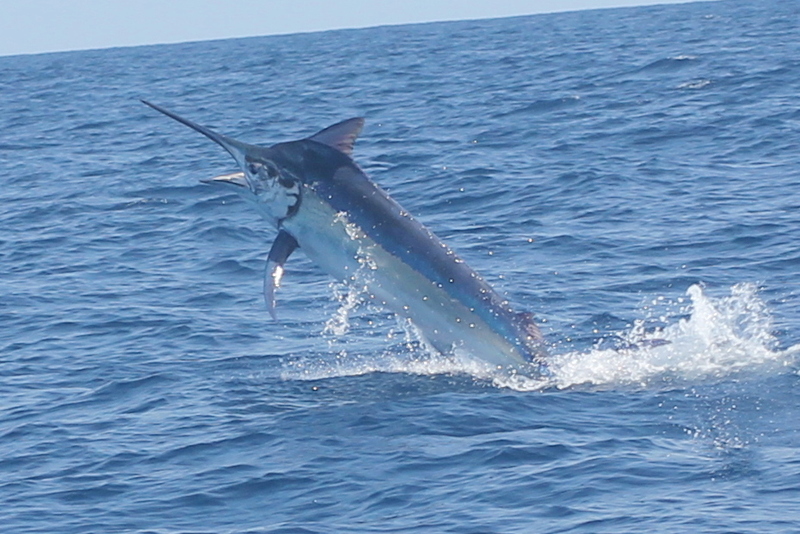 Panama also has a consistent fishery for mid size (200-600lb) fish and Puerto Vallarta, Mexico can be very good in the fall. The captains I have fished with have liked the periods a few days before or after the full moon.